Unibridge® components can be transported in standard shipping containers and on standard semi trailer trucks. Together with a minimum number of different components, Unibridge® can be erected even in the remotest locations using minimal manpower with some mechanical handling equipment. The bridge is extremely robust and capable of accommodating a wide range of vehicles and traffic, including oversized and overloaded vehicles. Minimal maintenance is required and the bridge can therefore be left in-situ with the peace of mind that the structural integrity of the bridge will not be comporomised. The main structural members of the bridge are prefabrciated girders which support the deck above, therefore there is no chance that any vehicles crossing the bridge may collide with the structural members causing a potential bridge failure. 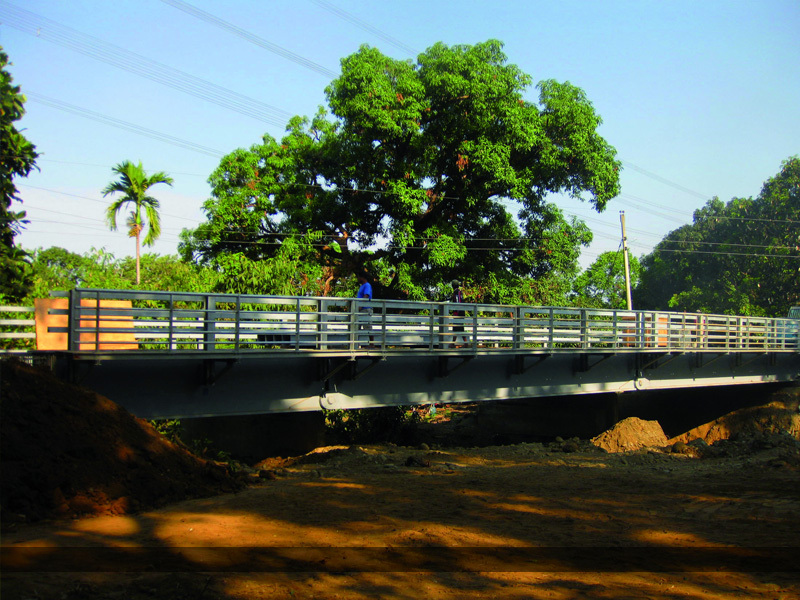 Unibridge® can be supplied as a single lane bridge or with multiple lane road width. Maximum clear spans up to 45m are possible. The deck surface can either be a steel deck system with anti-skid coating or concrete deck.